When you have a down day with bad weather, you read a whole book in one day. 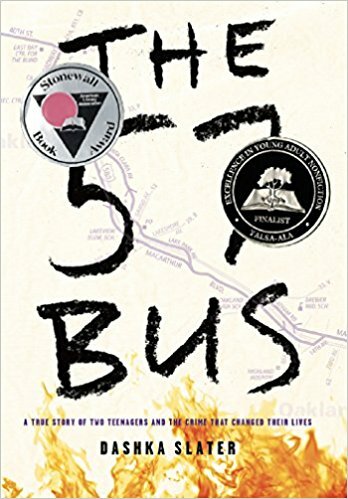 This book is about two people - Sasha, an agender young person who lives outside of Oakland California, attends a private school, has an intact, loving family and lots of friends. The other is Richard - a studend that attends Oakland High School, has friends but most of them are in trouble or in jail. He does have a loving mother but she struggles to keep him out of trouble. Despite their different schools, both kids take the same public bus - the 57 Bus - to and from school each day. They don't know each other - haven't ever even met. But one day, Richard - coaked by his friends - decides to play a practical joke and lights Sasha's skirt on fire. What results is Sasha spending weeks in the hospital recovering from severe burns, and Richard arrested for the crime. The book goes back and forth between the two kids - both the same age - and talks about their upbringing, their problems, and what lead them to that fateful day. This was an okay book. I was interested in it because it was a true story. The book does a good job telling the back story of the two kids, and covering the trial and what happens to both kids once the trial is over. IT does go a little too indepth into subject matter realted to gender identity. And while I did learn quite a bit, I don't think it really was needed to tell the story in this case. I think giving us more character development would have been more beneficial. I think this book is worth a read. It was a really fast read - a lot of the chapters are only a few pages long, so it moves along quickly. The story happened only a few years ago, and you can actually look up the news stories from the incident and see pictures of the kids online. The subject of gender identity is a hot button in today's society.